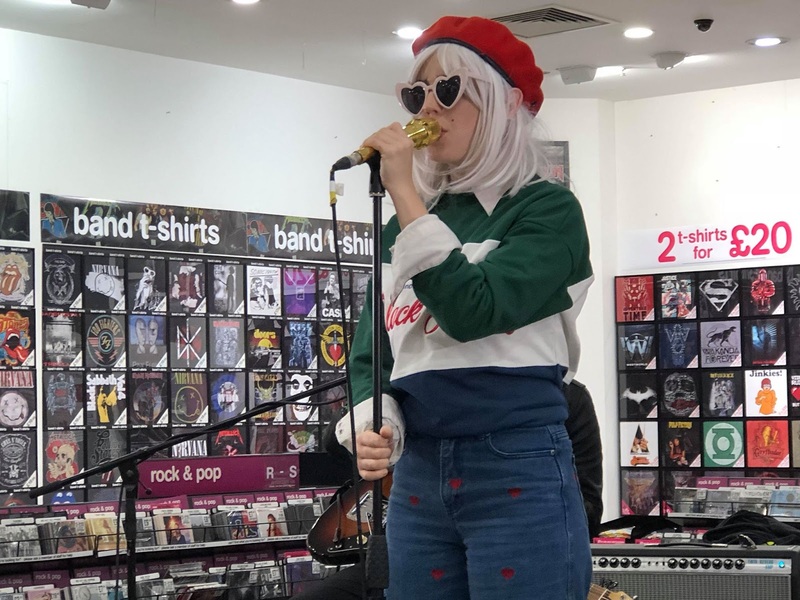 Black Honey are on a whistlestop tour of UK record stores to promote their self-titled debut album released last Friday. Included on the tour was an early afternoon stripped down set at Manchester’s HMV where they performed a seven-song set before sitting down to sign everything and anything. It’s difficult to reconcile that Black Honey are, as Izzy tells us, still unsigned. Their debut album sits proudly in the upper echelons of the midweek charts, the physical product (especially the double picture disc that also collects early singles on disc two) looks beautiful and they’re one of the friendliest most engaging bands around with a genuine connection with their fans. And, of course, the music. Their set is taken from the album and the songs positively radiate everything about Black Honey. Izzy’s voice is given room to show just how expressive it is on songs that in their normal live environment take on a more direct route. Chris, Tommy and Tom could take minor billing in the presence of such a charismatic striking band leader, but they add so much with these reinterpretations of songs that have soundtracked the here and now of many of the younger members of the audience and in the way they also interact later at the signing. Black Honey recreate the band as a gang philosophy to a tee. There still feels like there’s a sense of incredulity that they’re here, but you can tell they’re loving every moment of this and when Izzy declares that they’re coming for the rest of the world and the audience clap and sing along as they start up the last song Hello Today, you better believe them. Black Honey are on Facebook and Twitter. They play Bristol Rough Trade (September 26, 1pm), Marlborough Sound Knowledge (26, 6.30pm), Nottingham Rough Trade (27, 5.30pm), Bristol Thekla (October 13), Brighton Concorde 2 (14), Birmingham O2 Academy 2 (15), Norwich Arts Centre (16), Leeds Church (18), Newcastle Riverside (19), Glasgow Stereo (20), Manchester Academy 2 (21), Nottingham Rescue Rooms (23) and London Camden Electric Ballroom (24) before heading to Europe in November. Wicked write up for probably the only unsigned band in the charts.